Was this Gunston goal touched? Both sides are disposing of the ball with 71 per cent efficiency in their defensive 50 for the final term. After 12 disposals in the first three quarters combined, St Kilda's Logan Austin has effected eight so far in the final term. 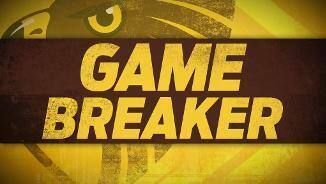 Hawks InterchangeBen McEvoy off due to an injury. St Kilda has generated the last six inside 50s, but has not scored from any of these entries. Saints InterchangeBailey Rice off due to an injury. The Saints have been caught holding the ball eight times in the game, including three times already in the final term. Saints InterchangeJarryn Geary and is possibly out for the game. Hawk teammates Liam Shiels (405) and Jack Gunston (404) are the only players on the ground to have gained in excess of 400 metres. Hawthorn defender Ben Stratton does the little things to help his team. His tally of 13 one percenters is more than double the next most of any player on the ground. Hawthorn has outscored its opposition by a total of 196 points in third quarters this season, second best in the competition. They continued their good third quarter form tonight, taking the honours by four points for the term. 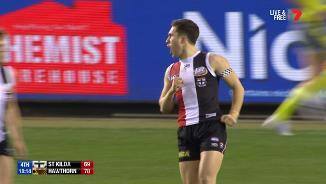 With his fourth goal tonight, St Kilda's Jack Lonie produces his careerbest tally. His previous high of three was kicked on two occasions during the 2016 season. In the last ten minutes of play, the Hawks have dominated time in possession, 51 per cent to 34, while kicking 4.1 to 1.1. 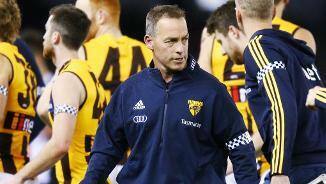 The Hawks have won the last five clearances, including the last two to Tom Mitchell. First year Hawk Conor Nash kicks his first goal in his second AFL game. While St Kilda's Lewis Pierce trails Hawk Ben McEvoy in hitouts (13 versus 19), he has directed six hitouts to advantage, compared to three for McEvoy. Saints InterchangeJack Newnes off due to an injury. Of the 10 free kicks conceded by Hawthorn, the most common indiscretion has been four times for a push in the back. St Kilda trail narrowly at half time, but will be encouraged by a second term in which they won the disposals (7975), tackles (15-9), and clearances (11-7), and outscored the Hawks 5.3 to 3.1. Jaeger O'Meara is leading the Hawthorn disposal tally with 13. However, his disposal efficiency of just 46 per cent is well down compared to the Hawks percentage as a team, 76 per cent. The Saints Tim Membrey has been targeted a matchhigh six times inside forward 50, taking two marks from these targets. Averaging a careerbest 8.0 clearances per game across 20 previous matches this season, Hawthorn's Tom Mitchell has been held to just one to this point, predominantly opposed to Jack Steele. St Kilda has won 13 of the last 15 clearances. With the first major of the second term, the Saints' Jack Lonie matches his careerhigh for goals in a season with 12. While Hawthorn controlled the early going in the first term, the Saints steadied late. In the last ten minutes of the quarter, St Kilda won the disposal count 37 to 29, and clearances seven to one, while kicking 1.1 to 1.2. The Saints are winning the contested possession count 44 to 25, yet their poor disposal efficiency (68 per cent compared to Hawthorn's 83) sees them trailing on the scoreboard. 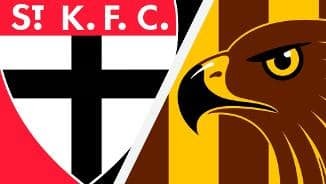 Even though the Hawks are winning the time in possession 43 per cent to 36, they have still laid more tackles than the Saints, 12 versus eight. St Kilda's Sebastian Ross recorded a careerhigh 43 disposals against Essendon last round. He is continuing this form tonight, where he is currently leading the disposal count with eight in less than half a quarter. Early disposal efficiency favours the Hawks 77 per cent to 54. 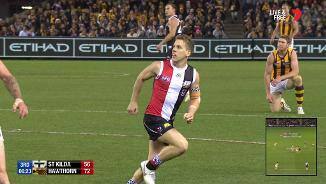 A Blake Hardwick clearance breaks a St Kilda streak of three to start the game. Opening goal scorer Jack Gunston delivers his 43rd major for 2018 in his 20th game of the season. St Kilda has recorded a shot at goal accuracy of 43 per cent this season, ranked 17th in the competition. 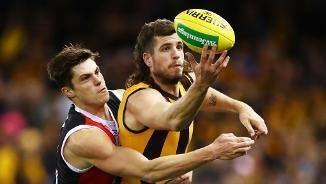 The Hawks have won the tackle count by eight per game this season, the best in the AFL. Welcome to Etihad Stadium for the St Kilda v Hawthorn Round 22 clash. 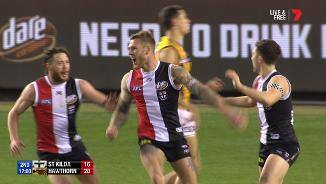 HAWTHORN has survived a huge scare from St Kilda to hold on for a four-point win at Etihad Stadium and set up a thrilling final-round battle for a top-four spot with Sydney. The Hawks won 12.8 (80) to 11.10 (76) in a surprisingly close encounter with the plucky Saints, who fought it out despite losing captain Jarryn Geary to a concussion/neck injury in the last quarter. And, they also managed it without kicking a goal in the final term and being forced to repel multiple desperate forward forays by the Saints; the last of which was cut off by Jarman Impey with just 45 seconds left on the clock. 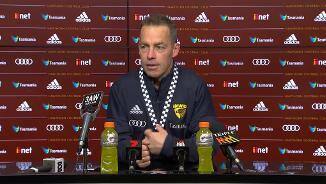 "We were a bit disappointed with how we played, particularly in the last 40 minutes of the game," Hawthorn coach Alastair Clarkson said. "To be fair, I think the better side lost tonight. 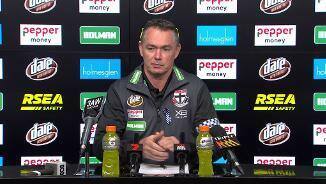 "We're fortunate that whilst we didn't kick many goals in the 40 minutes of the game, neither did they - it was a pretty uninspiring last quarter. "We're very, very fortunate we snuck away with four points out of that game." The win means next Saturday night's clash with the Swans will decide which team finishes in the top four. Both sides are locked on 56 points going into the clash, along with Collingwood, which is third with a slightly superior percentage to the Hawks. The Hawks may have to face the Swans without James Frawley after the defender sat the second half out because of a jarred back. Still, their positives were headlined by the successful return of ruckman Ben McEvoy from a fractured cheekbone. McEvoy, who hadn't played since round 16, was a dominant force in attack against the Saints' defence, which was without Nathan Brown (suspension) and Jake Carlisle (late withdrawal). He took four contested marks and kicked two goals along with his 32 hit-outs, showcasing his worth as a forward option as well as a ruckman. Jack Gunston was their main weapon with four goals while Jaeger O'Meara was their most damaging midfielder, especially in the second quarter when Tom Mitchell was struggling with the close attention of Jack Steele. Mitchell had 31 for the game but the Saints tagger also spent time on O'Meara after the main break, such was his influence in the first half. The Saints were led by Seb Ross (34 disposals) while Jack Lonie kicked a career-best four goals; three in the third quarter, which kept them in the contest in what has become the "danger" term for the team. Steele was also impressive with 29 disposals and a goal despite being tasked with running with Mitchell and O'Meara at times, and Geary kept Isaac Smith to 16 touches before going off in the fourth term. The contest looked set to play out as expected in the first quarter with the Hawks neatly transitioning the ball from defence and the Saints trying but lacking polish when it mattered. Even though the Saints had been messy, they'd hung in there, which became their mantra for the night. Three unanswered goals in the second gave them their first lead of the game, and although it changed three more times by half-time, they were well ahead at the clearances (28 to 17) and in contested possessions (85 to 60) and trailed by just five points at the break. 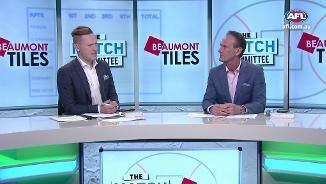 The Saints stuck around in the third, and although they still showed signs of a rebuilding side throughout the scrappy second half, they proved they still have a heartbeat by pushing a top-four contender all the way after what's been a disappointing year. Coach Alan Richardson said there were signs of improvement from weeks gone by when they've been run over immediately after half-time. "That was better. That was much more like four quarters," Richardson said. "There was a period in the third quarter where the Hawks really got going but unlike what's happened in the past two weeks, where we've had pretty strong first halves - we've won both last quarters - but fallen away really badly in the third and when the opposition have got going, we just haven't been able to stop it. "So that was really pleasing that we were able to stem that flow and get back in the game." St Kilda: Jake Carlisle has had a sore back for a number of weeks, and when combined with the birth of his first child late this week, was a late scratching for the game. He is expected to play in the season's finale next week. Jarryn Geary was concussed in a final quarter incident and should be fine given they have an eight-day break while Jack Steven looked hobbled by a sore knee late in the game. 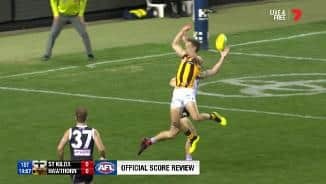 Hawthorn: James Frawley jarred his back when he landed heavily from a marking contest with Tim Membrey in the second quarter. He didn't return, largely as a precaution ahead of next week's important clash with the Swans, but will be further examined during the week. 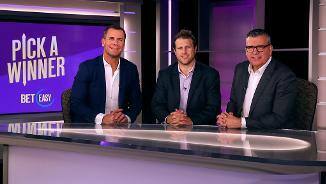 The Saints will feature in the very last game of the home and away season when they face North Melbourne in a Sunday twilight clash at Etihad Stadium. Meanwhile, the Hawks will travel to play Sydney at the SCG in a Saturday night encounter that will determine who finishes in the top four.